Each qualifying handheld product purchased must have an accompanying amount of 2-stroke oil or pre-mix fuel added to the original receipt in order to qualify. For example, if a consumer purchases a 455 rancher chainsaw and a 125B handheld blower and would like to have them both qualify for a 4 year limited warranty, they will need to purchase at least 192 oz of premixed fuel (96 oz for the chainsaw and 96 oz for the handheld blower). How to register your product? 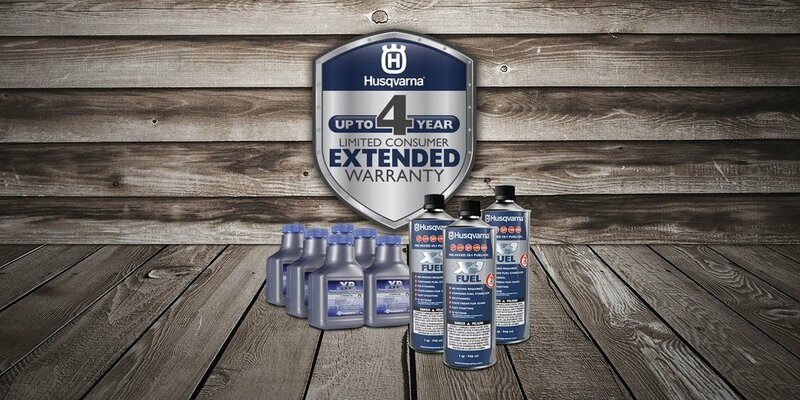 Product registration must be completed by the dealer or the consumer for any extended warranty. During the product registration process, a copy of the receipt must be attached to the registration either online or via mail-in. Need to know how to find your model & serial number for your Husqvarna products? Husqvarna Dealers (Like us!) Nationwide and Lowe’s. *Consumers are required to keep their proof of purchase for the length of warranty should verification be needed. Husqvarna reserves the right to ask for this receipt prior to warranty work being performed.